Another great artist that was recommended to me recently was Australia's Gotye. I had never heard of him, but I am a big fan of Australian artists, so upon quick inspection of his myspace page I could tell right away he's a talented fellow! One of the descriptions of his music on his myspace page is melodramatic pop and that's exactly how I would describe his music. He can go from poppy to darker slower tracks with some cool samples thrown in from time to time for good measure. I love artists that have some range and aren't just one trick ponies. Those are usually the bands/artists I tend to like more. His videos are pretty extraordinary! His video for 'Heart's a Mess' and 'Coming Back' remind me of Tim Burton. Dark and wonderful! 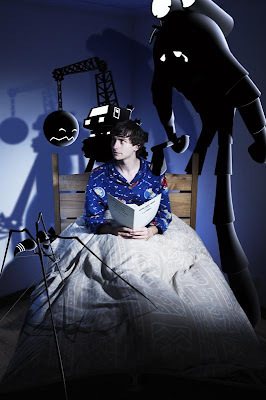 The lanky robots with his face in it on 'Heart's a Mess' reminds me a bit of Nightmare Before Christmas. The others are cartoon animated and quite enjoyable as well. Here is the mp3 for 'Thanks for Your Time' one of my favorite tracks of his, plus a dancey Styrofoamkid (Styrofoam?) Remix for 'Learnalilgivinanlovin'. His full length album 'Like Drawing Blood' is available for purchase on Itunes. In addition here are a couple of those great videos I was talking about. You can see the rest on his myspace page. great find! So Tim Burtonesque!! This is awesome!